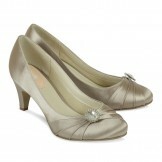 Our Navy evening shoes and wedding shoes category has been created with our bestsellers from our shop. Navy shoes and occasion shoes are classic and timeless, and just to explode your choice even more regarding styles why not look also at the satin shoes as the majority of these shoes can be dyed to navy for you. 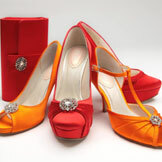 Just to make your navy shoes even more special why not add a shoe clip. If you decide you might like to explore our dyed navy shoes why not ask The Wedding Boutique for a free navy colour swatch to see how this will go with your outfit. After a particular colour or shade ?